I applied to Chelsea School Art in 1984 for its reputation, location and the fact that its prospectus arrogantly contained no photographs, a brutalism I found appealing. The clincher, though, was Alexei Sayle, the angry stand-up described in an early review in the London Review of Books as a “portly, spring-heeled Liverpudlian with an Oliver Hardy suit.” I’d identified him as a Chelsea alumnus in a 1983 episode of BBC1 documentary series Comic Roots, in which the thirty-ish Sayle was filmed drinking in the union bar bemoaning the “three years of total nonsense” he spent at the school between 1971 and 1974. It was thus with some solidarity that I devoured the first chapters of Sayle’s terrific second volume of memoirs (the first, 2010’s Stalin Ate My Homework, mined his family’s Commie roots and left him on a foundation course in Southport). Through parental influence a card-carrying member of the carefully named Communist Party of Britain (Marxist-Leninist) since short trousers, he was drawn to London by “all the rock gigs, exhibitions and plays … I didn’t actually want to go to any of them, I just wanted to live in a place where they were on.” This will ring true to anyone who has ever gravitated towards the capital. Now 63, he writes with the wisdom of someone taking stock and retrospectively hymns Chelsea as “a wonderful and humane institution” – the Soviet-sounding “painting council” declined to throw him off the degree course after he showed them a film he’d made satirising them. Gently mocking his own granite political convictions, he praises the “high quality of snacks” as “a little known benefit of revolutionary politics,” and sees the funny side of his domineering Maoist mother Molly sending Christmas cards in the late 70s bearing the legend “Season’s Greetings from H Block” at the time of IRA prisoner Bobby Sands’ dirty protests. This instalment ends circa “the first summer of the Miners’ Strike,” around the time Sayle was asked to film the edition of Comic Roots that drew at least one teenaged comedy fan to Chelsea School of Art. Thatcher stole his trousers, but he changed my life. I’m not going to repeat any of Seinfeld’s gags, suffice to say, this was all observational stuff, as we’ve come to expect from the stand-up that used to bookend his sitcom. Much of it is sharp as a tack, some of it is unoriginal in subject but marginally more original in execution, and all of it is delivered in such an assured and economical manner, you can’t fail to have a good time. I laughed a lot. Many people around us didn’t laugh at all, especially – if I may generalise – the women, but smiled instead. On one or two golden occasions, a spontaneous arena-ful of appreciative applause broke out. Nobody whooped. I was glad about that. It’s great to see a stand-up on top of his game, albeit reciting very old material in places, and you’ve got to hand it to a man almost in his sixties for doing so much material about technology without simply denigrating it from an old man’s Luddite perspective – he’s a modern man; he does not necessarily mock the BlackBerry, he mocks the type of person that uses one. He does not pretend to not know how email works, he merely bemoans the fact that it is not delivered once a day like mail used to be, but all day long. Even the material on marriage and fatherhood seems fresh, because, as he makes clear, he’s a late adopter to these two institutions, having married at 45. Thanks to the above laminated guest pass – something neither of us expected when we picked up our comp tickets – Richard and I had access to the inner sanctum backstage. (It’s called the Sky Bar, as it’s sponsored by Sky.) When Al played, the outer sanctum was the inner sanctum – it’s where Al was – but this time, an inner sanctum was created so that Jerry didn’t have to mix too heavily with the assembled freeloaders, just the higher echelon of freeloaders. I don’t know why this included us, and once we’d dared to enter the inner sanctum, it was pretty much empty. We were happy to have bumped into Simon Amstell and Richard Bacon outside while we tried to actually find the lift that took you to the Sky Bar, but that – or so it seemed – was the full compliment of celebs. Then Clive Anderson turned up, which was nice. We were happy enough with the turnout at this point, and the beer was free (if still served in plastic bottles, even in the inner sanctum). Then, as if by magic, all the real comedy celebs appeared – it seems that they had been watching the show from some exclusive box or something, not from the scummy rows of seats where Rich and I had been. But they were welcome to it. I loved it in Row E.
Anyway, within minutes, we were in the rarefied proximity of Ricky Gervais, Stephen Merchant, Angus Deayton, Lise Mayer, Harry Hill, Lee Mack, Chris Evans, George Wallace and … Seinfeld himself. No, we didn’t speak to him, but we spoke to Ricky and Steve, and they’d spoken to him. (The famous comedian Omid Djalili had been sitting next to us in Row E, but he chose not to go to the after-show.) I found myself having an impromptu script meeting with a TV exec who has commissioned a group-written sitcom I’m working on (can’t say any more), which was not really what I expected to be doing at the Seinfeld after-show, but I suppose was poetic enough in its own way. At least I was talking about comedy. I have only met Ricky Gervais a couple of times in my life, but he is always gracious enough to say hello to me when someone that famous could easily just blank me, and I appreciate that. He is a just a bloke, after all. (He’s arguably as famous as Seinfeld. Think about that.) There was a man in the inner sanctum who seemed to be bothering all the celebs with what might well have been requests for his entirely worthy charity, but he had crossed the line I feel, and had become a pest. (He had swapped glasses with Chris Evans seconds after Chris’s arrival, and Chris was totally patient with him, but I found it very uncomfortable. I am as guilty of anyone of gushing to people I admire – you know that – but this man, a serial botherer, seemed to actually be driving people away. I guess you’d have to call it liberal interventionism. Richard and I left around midnight, having at least breathed in air that Jerry Seinfeld had exhaled, and presumably added to the air that he was breathing with our own exhalations, and missed the last Tube home, so we had to share a cab to his house and pay through the nose for it. The “O2 Center” is a very good venue, well signposted, helpful staff, but it is a long way away from civilisation. 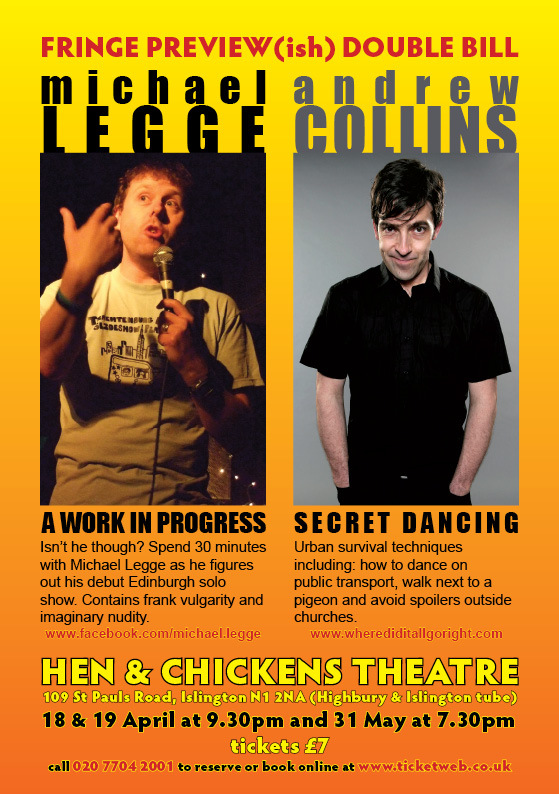 Anything to add to this plug for the Collins/Legge double-header? Only to point you at the place where you can book tickets: April 18, April 19 and May 31. I shall be doing Secret Dancing and trying out the words and jokes I am currently working up around it. And I need volunteers. Michael Legge will be a professional comedian. We’d love to see you.